These beads are art work by themselves. I added silvertone swirl spacer beads to create an asian feel. This braceelt measures approx. 8" and will fit most wrists with a toggle clasp. 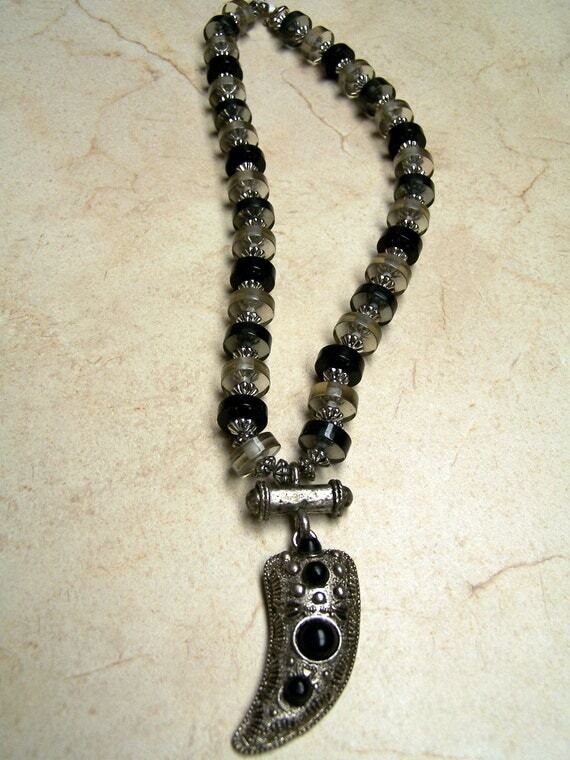 The focal on this necklace makes a statement by itself, but I added acrylic black and clear disks for affect. This necklace is approx. 12" which includes the 2-1/2" focal. I started with a black bumpy glass bead. The bumps are pink with a white base. This ring is wrapped in gold plated copper wire that is non-tarnishing. 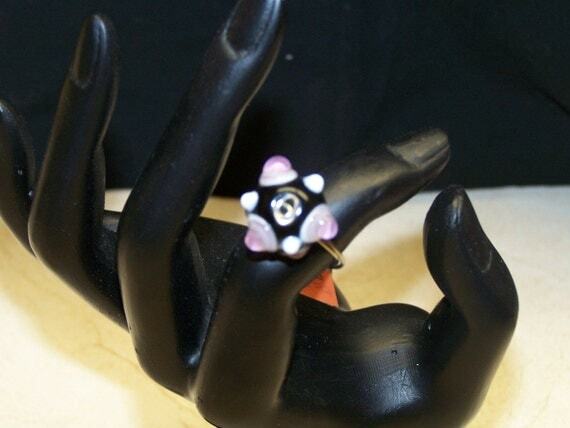 The ring is size 5-1/2 US but can be resized to anywhere between 1 and 15 US. If you do need a different size, please let me know in the "note to seller" section at checkout. 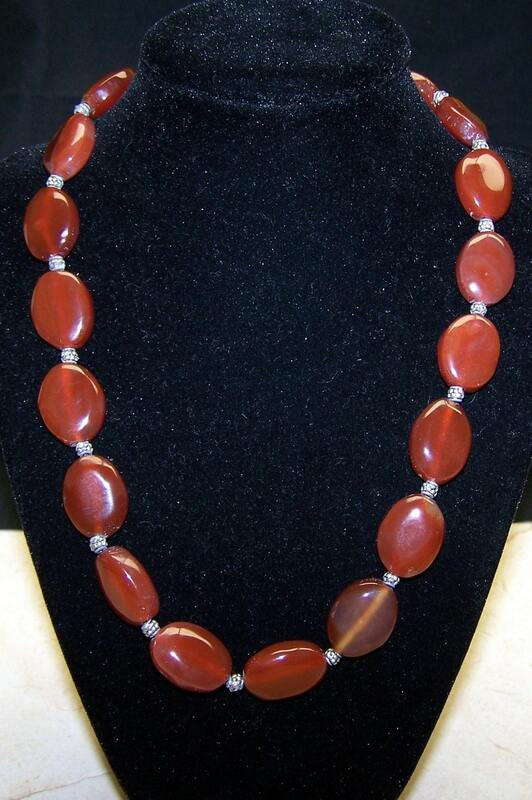 I love these red corral beads. I have used them in a ton of different items. These earrings are super simple, yet dramatic. 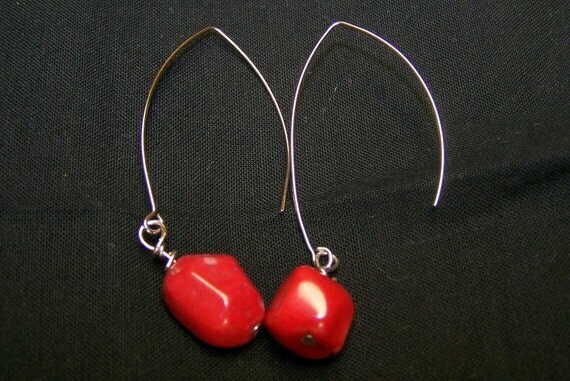 I took two red corral beads and wire wrapped them on silvertone triangle earring wires. 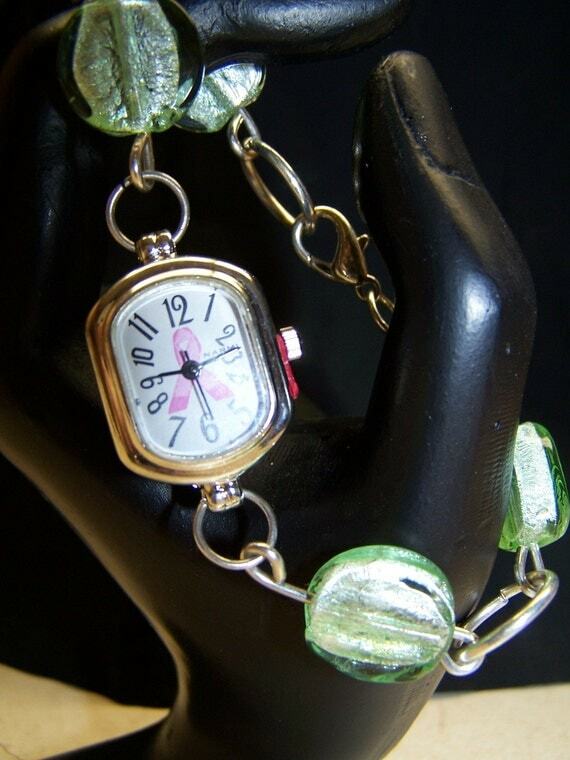 They hang approx.2-1/2"
I started with a lovely breast cancer watch face and added green foil glass beads with silvertone rings. This is a lovely way to support a worthy cause. A donation will be made to breast cancer research in your name. The watch is approx. 8" with an easy to fasten lobster claw clasp. This necklace is simple but elegant. 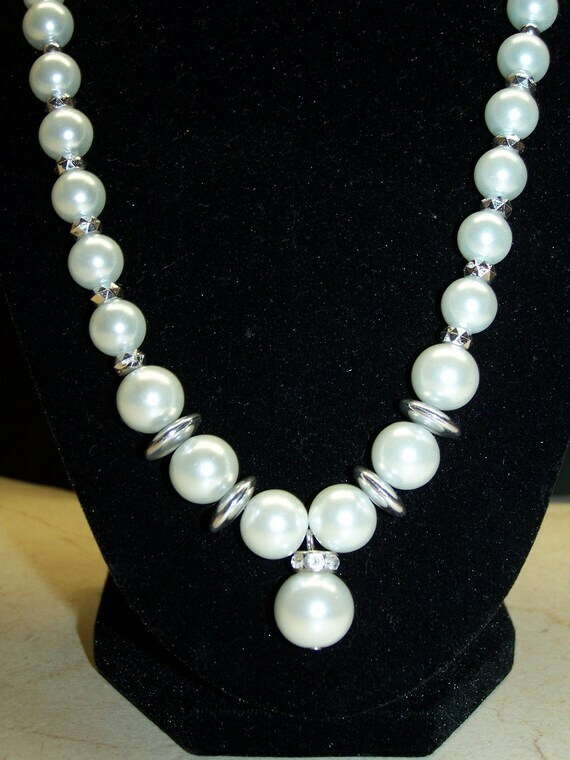 It has a small y look made with assorted sized glass pearls. I also added sterling silver spacer beads. It is approx. 10-1/2" long and has an adjustable clasp. 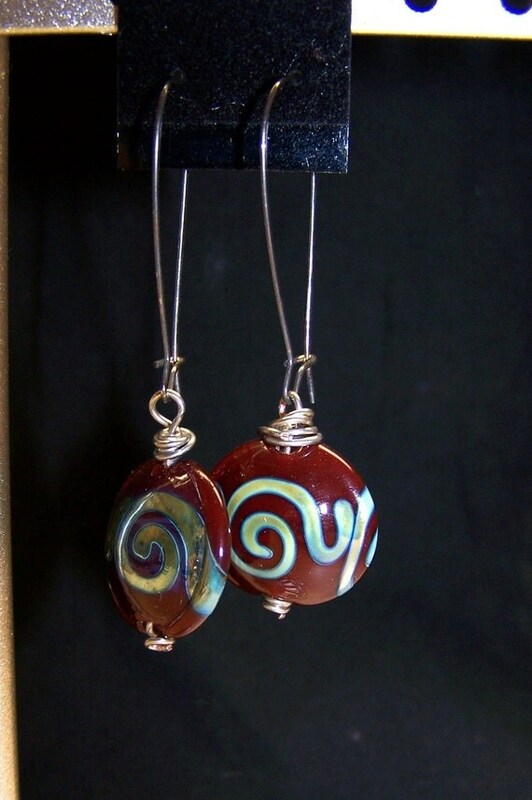 I love these lampwork beads. They were made by a friend of mine and I think they look great on these long earring wires. They are approx. 2-1/2" long. This bracelet is strung on two strings of power cord and is very strong. 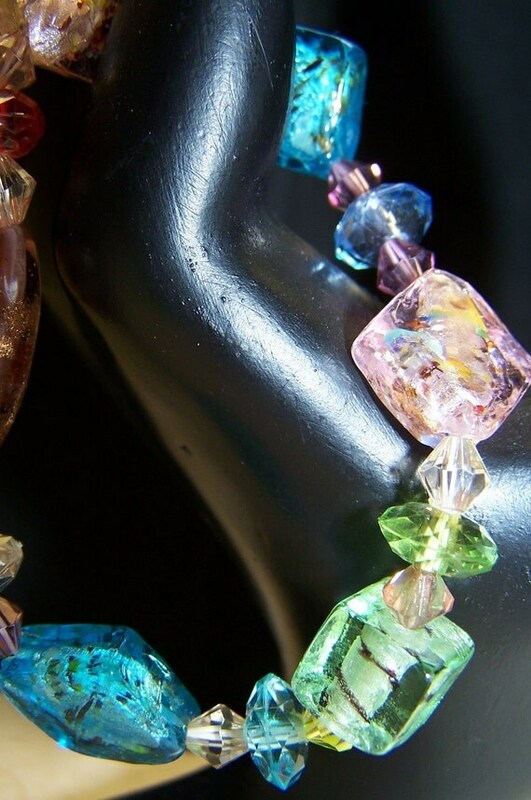 I used assorted color glass beads for a dramatic look. This necklace is spectacular. 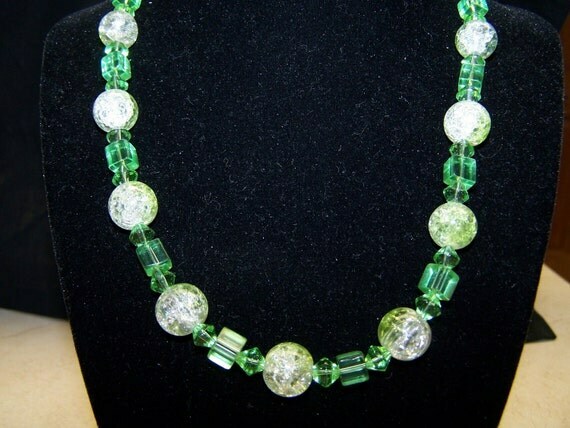 It has a lovely amount of green beads mixed with clear glass beads to be great with a t-shirt or a nice dress. 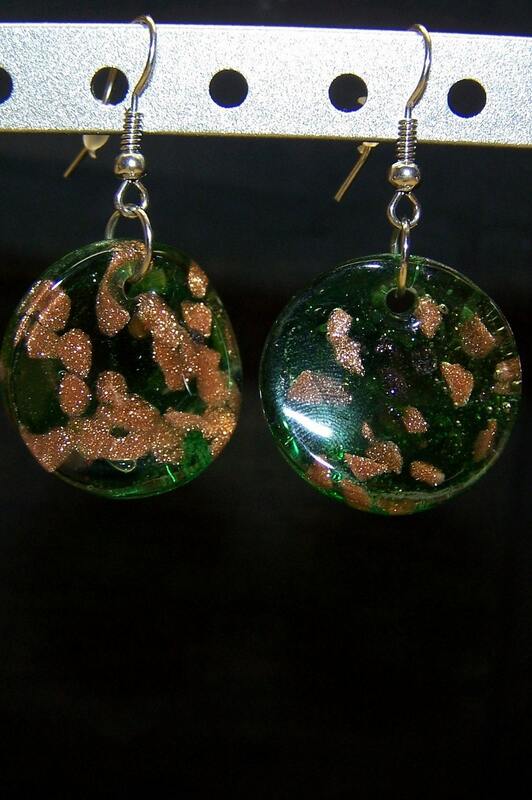 It is made with clear glass crackle beads, square glass green beads and green glass crystals. It is adjustable by 1" and measures approx. 8-1/2"
These are super cute. 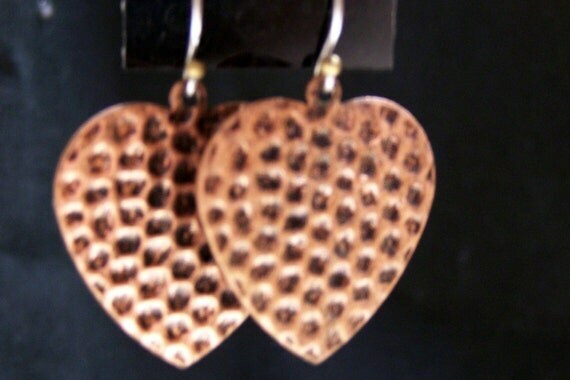 I started with copper heart blanks. I then hammed a small texture on them. These earrings are approx. 1-1/2" long. 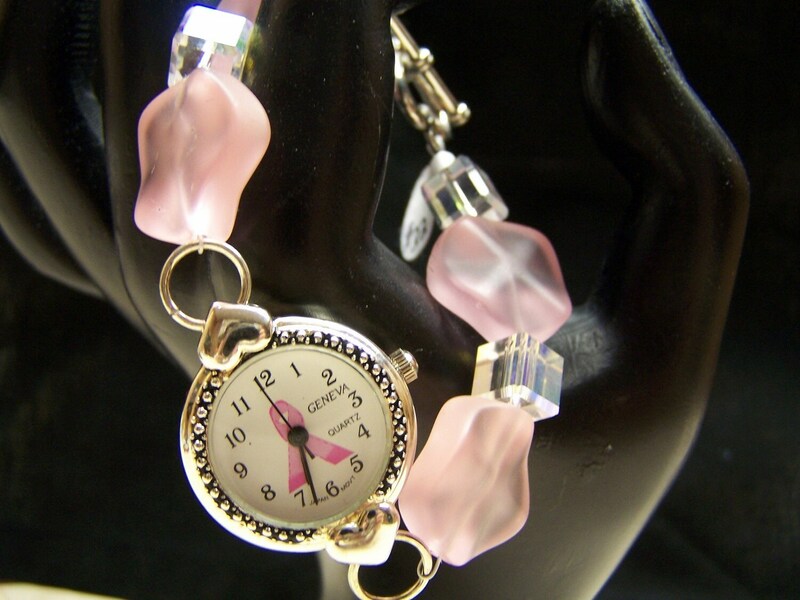 I started with a lovely breast cancer watch face and added frosted pink glass beads with square crystal beads. This is a lovely way to support a worthy cause. A donation will be made to breast cancer research in your name. The watch is approx. 8" with an easy to faster toggle clasp. 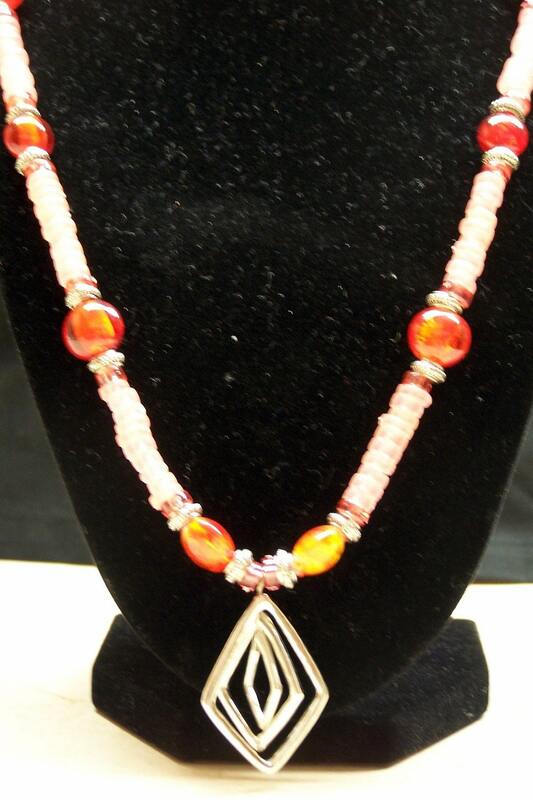 This necklace is made with light orange spacer beads, orange glass foil beads and a silver focal. It has a Hook clasp and is approx. 12"
I found these glass beads in a mix of buttons. They have a slight twist to them, so they don't lay completely flat. The actual beads are approx. 1-1/2" long. Here comes spring!! 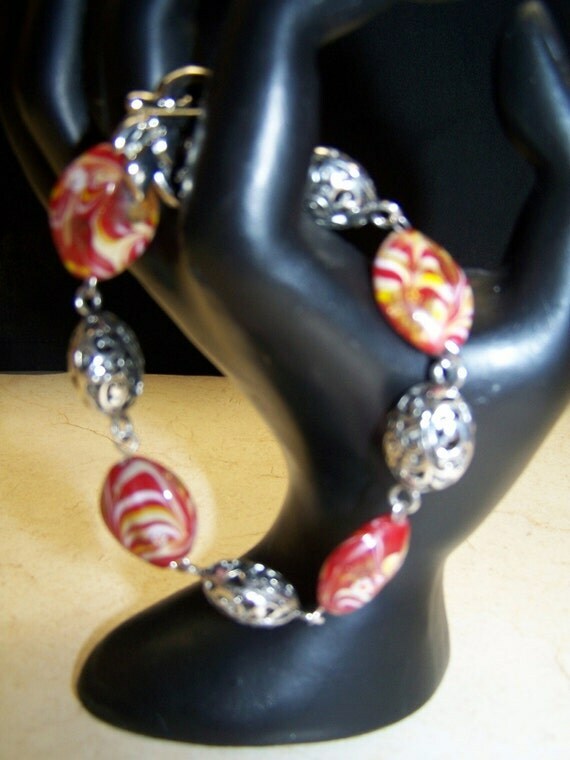 This bracelet is bursting with spring!! 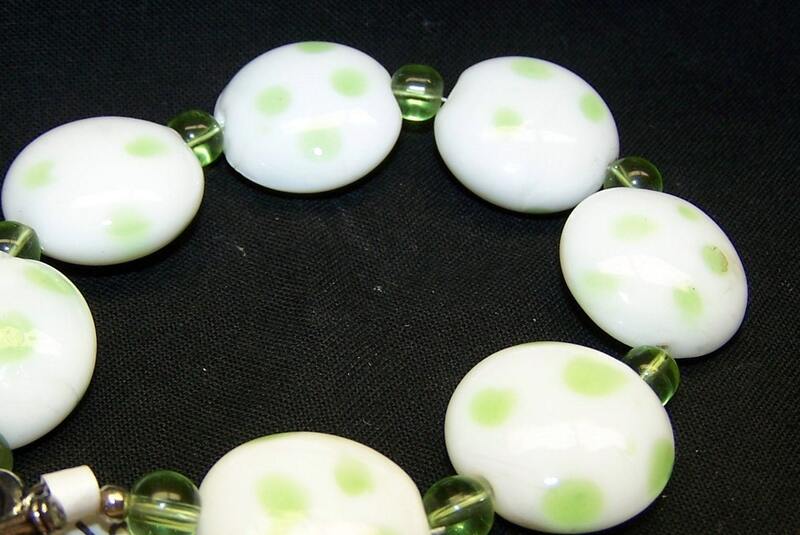 It is made with white glass puff beads that have cute little green glass polka dots. It has a toggle clasp for easy on and off. It is approx. 7-1/2" and will fit most wrists. I just love these stones. From the moment I bought them, I knew that they were meant to be a simple yet elegant necklace. They are varied shades of dark red, with some being translucent. I added small silver spacer beads to create a great look. This necklace is approx. 9" long and is adjustable. â™¥ .. â™¥ .. â™¥ .. â™¥ .. â™¥ .. â™¥ .. â™¥ .. â™¥ .. â™¥ .. â™¥ .. â™¥ .. â™¥ .. â™¥ .. â™¥ .. â™¥ .. â™¥ .. â™¥ .. â™¥ .. â™¥ .. â™¥ ..